Every event marketer knows that lead qualification starts with data collection, but collecting the right data makes all the difference. Unfortunately, ticking off an “interested in more information” box on an exit survey is easy to do, and thereafter also easy to forget. Instead, what if it were possible to track attendees’ exact behavior at your events? Which sections they visited and spent the most time in, and even which parts of a video game they played better than others to find out what they are really interested in? Thanks to a series of interactives that merge high-tech gaming experiences with data collection, that’s exactly what the U.S. Army and Air Force were able to do. As part of its 2010 Ex Award-winning program, Project Supercar, the U.S. Air Force set out to prove its technological chops, while snagging actionable leads all over the country. Project Supercar paired Air Force mechanics with Galpin Auto Sports (featured on MTV’s “Pimp My Ride”) to create two high-tech vehicles and show that recruits could Aim High, without getting into a fighter jet. According to Captain Homero Martinez, chief of event marketing for the U.S. Air Force, the technological aspects of the program drove data collection that has helped the Air Force meet its recruitment goals. “We knew we had to be extremely high tech to talk to these kids,” Martinez says. The experience began with a “What’s your ride?” survey, an interactive quiz that matches personality types with a type of car. The survey results divided the attendees into three groups based on technological interest, and each one got an RFID-enabled wristband. As they progressed through the experience, each stop required a swipe of the wristband to activate the games and experiences. Meanwhile, the RFID signal tracked each attendee’s travel path through the footprint, creating an activity map through triangulation, with time spent at each area highlighted, helping recruiters identify the key leads for follow up and to know exactly what to talk to them about. A longer visit at one career station, for instance, would allow recruiters to spark a conversation about that particular career path. 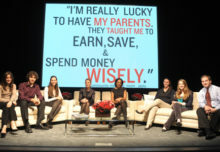 “Technology gives event marketers the ability to compete,” says Martinez. In its quest to fill its quota of 80,000 new recruits each year, the U.S. Army had to get high-tech or risk missing their numbers in 2009. To that end, it launched the Army Experience Center, which snagged a silver at last year’s Ex Awards for Best Mall Event. 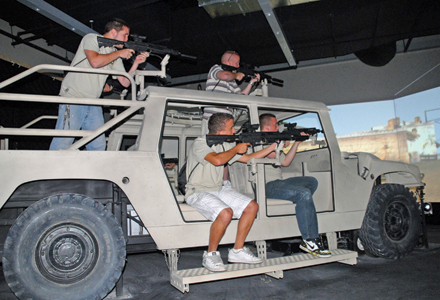 The experience, housed in the Philadelphia Franklin Hills Mall, incorporates an incredible amount of technological gadgetry, but the pièce de résistance is the interactive augmented reality game that puts players and prospective soldiers into the gunner’s seat of a Humvee or attack chopper. To get in, guests register and are set up with a photo ID that incorporates an RFID location-tracking card. Guests are instructed to swipe the card at each interactive inside. In the video gaming area, where attendees play an army-designed game that tracks not only time spent playing, but what job the players chose and how well they did, in real time, the appropriate recruiter can engage them on site and chat about their specific interests and performance within the game. This year, the Army launched a new AR game called Army-Race for Strength. It showcases the technology and training used to develop soldiers. The game was featured at the Army’s Strength in Action Zone exhibit at Daytona International Speedway, Auto Club Raceway in Pomona, CA, the Chicago Auto Show and was available online via a downloadable version. Besides NASCAR and NHRA races, it will roll out within the next few months into all of the Army’s events system-wide, including state fairs, air shows and high school visits. During the game, racecar “drivers” use a palm card that they receive during registration at an Army event to control the No. 39 U.S. Army Chevrolet as it weaves through a convoy of speeding Mine Resistant Ambush Protected (MRAP) and Stryker AV vehicles. Players can stop the game to receive more information about the U.S. Army vehicles with which they share the road. All the while, the activity and questions are tracked and recorded by the software.